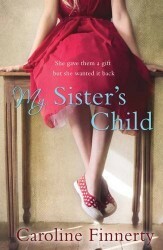 My Sister’s Child is the story of two sisters, and one huge question. Jo is the elder sister, responsible and hardworking. Isla is carefree and has always avoided being tied down. The sisters have always had a strained relationship, but when Isla asks Jo for something that rocks the very foundations of the family that Jo has worked so hard to have, she is horrified. And, as Isla persists in her pleas, Jo fears she will lose the one thing she holds most dearly. Thought-provoking and compelling, this is a layered and moving story of sisterhood, love and lies and the finely-woven link between nature and nurture that will challenge the way you think about motherhood. A clever and layered story of love, lies and sisterhood. Thought-provoking and compelling, this is a layered and moving story of the finely-woven link between nature and nurture.